Asian markets mostly fell Thursday after the Federal Reserve hiked interest rates and signalled a more hawkish tone for future moves, while US President Donald Trump stoked trade war fears by suggesting he will hit China with fresh tariffs. After a keenly watched meeting, the US central bank lifted borrowing costs, as expected, but indicated another two this year and four in 2019 as the world's top economy continues to improve and inflation picks up. While the Fed had earlier in the year been tipped to announce three increases each year, there had been growing speculation that it would have to be more aggressive to keep a lid on prices and prevent the economy from boiling over. Policymakers have been forced to change tack to take account of Trump's huge tax cuts in December, which have already started to take effect. But in a statement they stressed that rising rates were unlikely to hit the economy, which Fed chief Jerome Powell said was "in great shape". James McCann, global economist at Aberdeen Standard Investments, wrote in a commentary: "The (Fed) is now signaling two more hikes this year and has dropped its increasingly stale signal to markets that rates will remain for some time below those levels expected in the long term. "This shift reflects the robust domestic growth backdrop, which is being fermented by a late-cycle fiscal stimulus." All three main indexes on Wall Street ended down on the prospect of higher borrowing costs, which would affect investment, while the dollar was slightly weaker as traders had largely priced in further hikes. 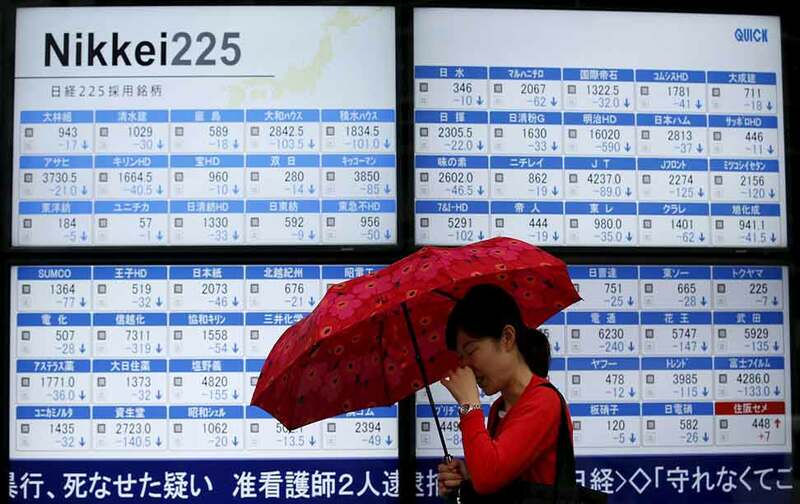 And Asian markets struggled, with Tokyo ending the morning 0.4 percent lower. Hong Kong was down 0.3 percent, with banks lower after the city's de facto central bank lifted its own interest rates to keep in line with the Fed. The HKMA and US central bank's monetary policies are linked owing to their dollar peg. Seoul fell 1.2 percent and Singapore was also off 0.2 percent. Shanghai dipped 0.2 percent while Sydney eased 0.1 percent. Eyes now turn to the end of the European Central Bank's meeting later in the day, with expectations it will discuss winding in its crisis-era stimulus. Trade war fears returned to the fore after Trump warned Beijing of possible fresh tariffs. "China could be a little bit upset about trade because we are very strongly clamping down on trade," he said in an interview aired on Fox News Wednesday. His comments come as he prepares to make a decision Friday on whether to impose measures on billions of dollars worth of goods from China. "You will see over the next couple of weeks. They understand what we are doing," he said. There are worries the Chinese side will retaliate. The comments are the latest in an ongoing dispute with the US's partners and come less than a week after he left a Group of Seven summit in tatters over trade differences. "Trade is going to be far more unpredictable going forward and so far markets keep trying to shrug it off as if it isn't going to happen," Michael Every, head of financial markets research at Rabobank Group, told Bloomberg Television. "When it finally happens maybe the markets will wake up and realise, wow, this is actually happening."